One of several writing magazines to which I subscribe, Writer’s Forum, has a regular feature on the inside back cover entitled Where I Write, in which established authors describe the space in which they do most of their work. This month’s (August!) edition also contains a longer article headed Room to Write in which eight writers explain where they escape to write, and whether they regard such a place as a “necessity or a luxury”. Amongst the “offices” cited by the respondents are specially designed, sound proofed studies, pergolas, sheds, beach huts, inglenook fireplaces and even the corner of the kitchen table. The accompaniment of dogs and music figure high in judgements of what aids creativity. As I am never likely to be invited to contribute to such a feature, I thought I would take this opportunity to inflict my own preferences on you. Firstly, there is no single place where I do all, or even the bulk of, my “writing”. The absence of a settled location in my house means I have to take my chances where I can. Despite being from a generation reared on pen/pencil and paper, I tend to compose directly onto a computer, although I do, as the scribbling sages advise, have a notebook and pen (and now smartphone) with me at all times to capture those rare and precious moments of inspiration. The front (second) bedroom – before the purchase, three years ago, of my laptop, and last year, my netbook, the fact that our single desktop PC resided here meant that this was the most common venue for my work. The fact, however, that it overlooks the road at the front of the house, and that there is a TV in it (and, of course, a bed! ), all play to my innate inattentiveness, so it was hardly ideal. And then, for some unaccountable reason, guests staying in the room started to complain when they found me hunched over the desk at three o’clock in the morning with one finger stuck to the “delete” button on the keyboard. The kitchen / diner – plenty of space, the most suitable table in the house and my most prized books almost within touching distance, but the insidious presence of yet more TVs in both the conservatory and living room, and all that food intoning “eat me” from fridge, freezer and cupboards alike make this far too distracting, though less so towards the end of the week when I feel as if I am auditioning for the role of Old Mother Hubbard. (Pause for the fifth cup of tea of the day). The (south facing) garden – a nice idea in the summer (if and when it arrives), but the glare of the sun, my recently acquired susceptibility to hay fever, and the noise of the neighbours’ children (or rather their fishwife of a mother), render it inconducive to concentration. There is a brick shed at the end of the garden, but I doubt that the mice, spiders and triffids would be too enthusiastic about sharing their home with me on a regular basis. The train – despite having cashed in my chips at the commuter casino three years ago, I still make a number of train journeys, principally to London and back. At around an hour they are useful for planning writing exercises, and if the compartment is relatively quiet (no loud mouth Blackberry users confusing it for their office or shopping parties discussing last night’s soap story lines), I might just be able to write something worthwhile. The main drawback, however, is what I call the “Meopham triangle”, a 20 minute stretch of the journey when my broadband signal tends to wander off. Cafés and Coffee shops (is there a distinction?) – there is something about the environment that lends itself to both thinking and writing, and that is not just the smell of fresh coffee or the availability of free wifi and (not so free) cake. Perhaps it is the steady procession of customers, inadvertently, in their demeanour or conversation, offering up ideas for characters, situations or thought trails. Inconveniently, however, you are usually obliged to buy coffee, which can be expensive. If it could stay hot for longer than 15 minutes this would be the ideal place – maximum time, minimum cost. The only solution is to buy a frappé, frappuccino or cooler (depending on your vendor of choice) – I can make a medium sized version last a couple of hours. Having seen what I have written above it is interesting to note that I appear to prefer, and get more written, out of the house – in a library or café – than in it. I think that reinforces my belief that there is a clear need to separate home from writing, though as some writers have claimed, that can be achieved in the physical space that constitutes that home. In the final analysis, I suppose it is, as the article in Writer’s Forum concludes, a matter of “finding your own space, whatever and wherever it is, where you feel comfortable and are the most productive”. The dream of a discreet study, either in the house itself or in its grounds, and surrounded by all my books, lives on. For the record. I have written parts of this article in a variety of places, including the kitchen, conservatory (with the fishwife in fine voice next door), on the 16.52 train from London Victoria to Ramsgate and Dover Priory and in my hairdresser’s waiting area. 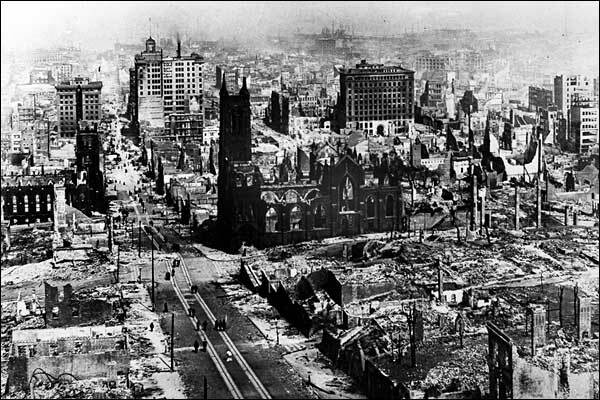 It is funny how it is only after I return from a visit to San Francisco that I start to ponder, even worry, about the prospect of a major earthquake hitting the city. I have recently been reading A Crack In the Edge of the World: America and the Great California Earthquake of 1906 by British born but recently naturalised American, Simon Winchester, a magnificent exploration of the origins, development and aftermath of the magnitude 8.25 Earthquake and ensuing Fire that hit the city on 18th April of that year, and it set me to thinking what is increasingly fascinating me from afar. It is not a question of whether a big earthquake will occur, nor even a question of precisely where it will hit. There will be a quake, it will be considerable, it will be somewhere in the vicinity of San Francisco, it will more than likely affect the San Andreas Fault or one of its cadet branches – and it will take place, most probably before 2032. The only true unknown is the precise year, month, day and time. The U.S. Geological Society actually issued a formal forecast in 2003. Sometime before 2032 , along one of the seven fault systems that belong to the San Andreas cluster, and which cut their way through the Bay Area, there is a machine-computed probability of 62 per cent that an earthquake with a magnitude of 6.7 or greater will strike. There will be damage and casualties “on an impressive scale”. All those communities, not least the major city in the area, have comprehensive plans for dealing with every type of disaster, as well as providing detailed guidelines for those “authorized to know what their duties and responsibilities are in the event of the most statistically likely major disaster that is anticipated in the region – and that is a very, very large earthquake”. And, of course, since the Loma Prieta earthquake of 1989 that, amongst its other effects, caused part of the upper deck of the Bay Bridge to collapse onto the lower and much of the Marina district to be destroyed, many buildings have been checked and reinforced to enable them to stand a chance when the next “big one” arrives. That is all reassuring I’m sure. But I wonder how far the citizens of San Francisco are truly geared up to cope when it comes. I suppose if the authorities kept hammering on about it it would instill a pervading sense of paranoia that would do nobody any good. But I have rarely seen or heard any references to the subject during my trips to the city. Having said that, it has not even crossed my mind whilst staying there – though I am becoming increasingly fascinated both by the historical context and the future potential for calamity. So does it concern me that my beloved city could be seriously damaged any moment? Of course. Does it deter me from visiting it often, and, hopefully, more than before, in the future? Not at all. Is there just a small part of me that hopes I am there when it happens? I think there might be (many witnesses of the 1906 quake recorded their excitement at being part of a major historical catastrophe, and more still posed for photographs amid the ruins even as their homes disintegrated). But do I wish it? Of course not. I know that I have a number of readers who would be directly affected by an earthquake. Do they think about it at all? Do they worry about it? Are they confident that they would know what to do if such a disaster struck? It would be interesting to know. Answers at the bottom of this post please. One of the most distinctive landmarks on the San Franciscan horizon, visible from most of the eastern half of the city, is 210 foot high Coit Tower on top of Telegraph Hill. This is the story of the eccentric woman whose lifelong dedication to the city’s firefighters culminated in bequeathing a third of her fortune for its construction. Lillian Hitchcock was born on 23 August 1843 at West Point, New York, the only child of Martha and Dr Charles M Hitchcock, a distinguished army surgeon, who had operated on the leg of Colonel Jefferson Davis. She moved with her parents to San Francisco in 1851. Two days before Christmas that year she was rescued from the upper floor of the hotel in which she and her father were staying. Thanks to the firefighters from Knickerbocker Engine Company No.5. she was unharmed, fuelling a lifetime’s devotion to the same crew in their red shirts and war-like helmets. This was in an era when fire carriages were designed to be pulled by hand. Firefighters lined up along a rope and pulled, like tug-of-war teams, in order to haul their engine to the fire. They would often be in competition with other companies to get to the blaze first. Such was the case when “Lillie” first saw her opportunity to repay “her men” for saving her when she was only eight years old. Seven years after that event, the pretty, tomboyish 15 year old was walking home from school when she spied an underhanded Knickerbocker Engine Company No. 5 falling behind the Manhattan No. 2 and Howard No. 3 companies in responding to a fire call on Telegraph Hill. Intelligent and quick-witted, Lillie hurled her school books to the ground nd rushed to help, finding a vacant position on the rope and calling out to other bystanders to help get the engine up the hill. Largely through her intervention, No.5 was the first to the fire. From then Lillie became the Knickerbocker Engine Company No.5 mascot and honorary firefighter, swinging into action at the sound of every bell. She was elected an honorary member of the company on 3 October 1863, making her the only woman in the US to belong to a volunteer fire station. Her energy and speed were the envy of even the fittest of firemen. She rode frequently with No. 5, especially in street parades and other celebrations, bedecked in flowers and flags. She wore a diamond-studded fireman’s badge reading “No.5” for the remainder of her life, started signing her name with a 5 after it, and even had its emblem embroidered on her bedsheets (some have suggested her undergarments too!). If a fireman fell ill she would sit with him in his sickroom, and provide floral tributes for the families of those who died. By the age of 18 she was the “undisputed belle” of San Francisco according to Chief Bowlen. Stories abound about her eccentric lifestyle. She was believed to have been engaged at one point to two men, wearing their engagement rings on alternate days. But she had resolved to marry wealthy easterner Howard Coit, a caller at the San Francisco Stock and Bond Exchange. Even after they had tied the knot in 1868, she continued to attend firemen’s balls and played poker with the men who nicknamed her “Firebell Lil”? She smoked cigars and wore trousers long before it was socially acceptable for women to do so, gaining her access to men-only establishments in North Beach. She is reputed even to have shaved her head to make the wigs fit better. Her position in polite society did not prevent her from following her heart and dashing from parties and weddings in her barouche at the call of the doleful clang of a fire engine. Embarassing though this was for her respectable husband, she was generally regarded as an amiable eccentric and ladies either ignored or humoured her. She was an “accomplished singer, dancer and guitarist” and enjoyed fine food, dining often at the famous French restaurant The Poodle Dog. She also kept her own recipe book. Like her North Carolina mother, she was a southern sympathiser during the Civil War, spending the early war years there before moving to Paris where she became a notable figure at the court of Napoleon III, on one occasion marching into a prestigious masked ball dressed head to toe as a firefighter. She also travelled extensively in the east, particularly India, where she befriended the Maharaj. But the lure of her adopted city, and in particularly its firefighters, was too much and she always returned to it, often bringing with her gifts from her regal contacts, notably rare gems, objets d’art and souvenirs. Her long-suffering husband died in 1885, leaving a $250,000 estate. This was the trigger for Lillie to return to her wilder days, accompanying five men on an overnight camping trip and disguising herself as a man in order to lurk around the grubbiest dives at the waterfront. Anxious to witness a prize fight she arranged for a pair of boxers to perform for her in her suite in the grand and elegant Palace Hotel in which she spent much of her later years. After she had the room cleared of furniture and breakables, the two men stripped and begun to pummel each other. Lillie watched this perched on a plush chair atop a table. After several rounds, and as the men had hit each other to a virtual standstill, the referee pleaded that the match be declared a draw, to which Lille retorted they should continue until a “bloody knockout”. The Boston Globe hailed the event as “pioneering a new way of life for women” but the New York Globe was appalled, labelling it a “staggering shock”. In 1904 a distant cousin, angered by her refusal to let him manage her financial affairs, broke into her room whilst she was entertaining a Major McClurry with the intention of killing her. McClurry stepped in and saved Lillie but was injured and died of his wounds. With the scandal still fresh, she left San Francisco and spent the last two decades of her life abroad. She inherited a further $60,000 and property from her grandfather. She died on 22 July 1929 at the Dante Sanatorium in San Francisco, bequeathing the city $118,000 (estimates vary from $100,000 to $125,000) to “be expended in an appropriate manner for the purpose of adding to the beauty of the city I have always loved”. 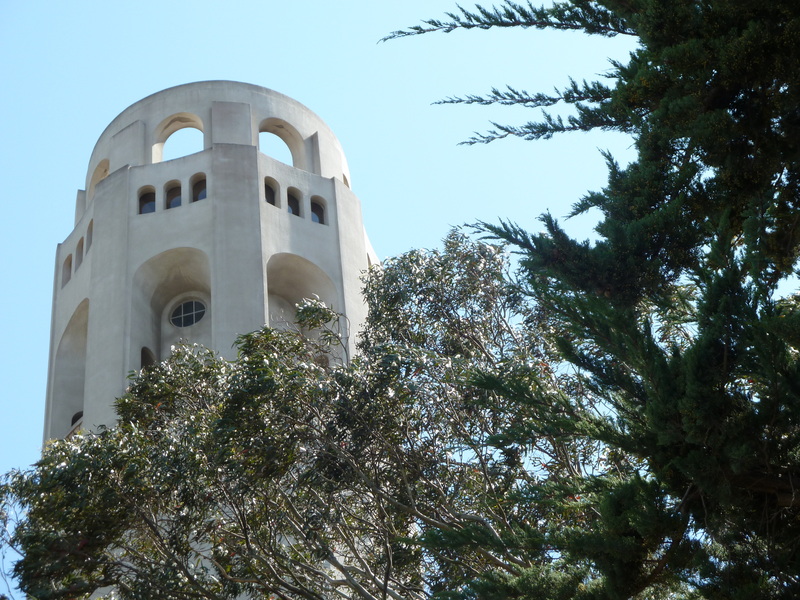 After lengthy deliberation, during which two of its members resigned on the grounds that Lillie had actually hated towers, the Coit Advisory Committee used the funds to build Coit Tower on the site of the first west coast telegraph 5 years later. In addition, it also erected the statue of three firefighters, one carrying a woman in his arms, that Lillie had commissioned herself, in Washington Square Park. It is this statue that she had intended should be the one to adorn Telegraph Hill. Because of the association with Lillie, the shape of the tower is generally, and not unreasonably, felt to resemble a fire nozzle. However, Arthur Brown Jnr, who also designed City Hall, refuted this suggestion. Other theories, including one not unrelated to her affection for the men she rode with, have been postulated, but none of these are any more plausible. 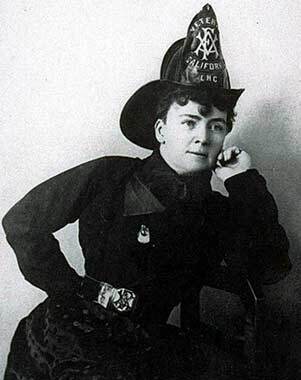 She remains the unofficial patron saint of all firefighters in San Francisco to this day. Today is my first day being a writer. Huh? What d’ya mean, first day being a writer? You’ve had this blog for 17 months, posted 128 articles, written nearly 90,000 words and had 35,000 views! I thought you’d put all that “am I / aren’t” I nonsense behind you when you posted the article http://www.tonyquarrington.wordpress.com/2011/12/16/yes-i-am-a-writer/ . So did I, but I was wrong. I may be writing but I’m not living the life of a writer. Yes, I’ve derived some personal satisfaction from doing it and thought some pieces were actually pretty good. And I’ve had a number of gratifying compliments along the way. But it just doesn’t feel right. So what does this “living the life of a writer” that you’re so obviously failing at really mean? It’s difficult to define but it’s to do with it being at the centre of my life – and it’s not. I have other commitments which, when push comes to shove, take priority and demand my time at the expense of writing. Well, of course, we all do, and it’s only right and proper that they should on occasions. I think you’re being too hard on yourself. Perhaps. I suppose, like everything in life, it’s a question of balance and something that I just have to keep working at. Don’t get me wrong, I don’t begrudge a second of the other important things in my life. It’s the time in which I could write that I am not making the most of. So what do you need to change? I continue to be too easily prone to distractions – social, digital and psychological. I have always been so and probably will never change. But I need to eliminate, or at least manage, them better than I do, starting today. So that’s all you have to do then is it? Hardly, that’s only improving the environment in which I can operate – there’s much more to it than that. I knew from the outset that, in this ultra-competitive world of writing, I was not going to be “discovered” overnight and handed a multi-book deal or a prestige magazine column just by virtue of a few blog posts. But in effect that’s what I have done – sat back and waited for someone with influence to say “hey Tony, we really like your work, can you write us an article on x, we’ll pay you for it”. Not going to happen. It’s not only sisters that are doing it for themselves nowadays – I need to put myself out there, make things happen. So what specifically do you need to do? I have a significant body of work, some of which I know can be adapted into pieces for relevant magazines, competition entries and more substantial commissions, and, essentially, made better. I need to be more disciplined, dynamic and determined. The compulsion to write is definitely there but indolence still reigns (thought I’d throw in a Diamond Jubilee reference there). At the beginning of this year I set myself writing goals for the next 3 years and detailed plans for this year, but, after a satisfactory start, they are not being followed through at present. I could blame, as always, distractions such as the April holiday in San Francisco and subsequent long days spent at the cricket, both of which have spawned some writing pieces, but it is too easy to do that and I won’t do it anymore. It’s time for proper planning, structure, organisation – and drive. Time to contact those magazines that might find both my existing and future work interesting and worthy, just possibly, of publishing, however meagre the remuneration might be. Time to enter those writing competitions (I have identified a couple today that have deadlines of the end of June/ beginning of July that look promising and require “only” a revision and adaptatation of articles that have appeared previously on the blog). Time to eliminate the distractions – not have e mails, Facebook, Twitter and cricket forums open on my laptop when I’m meant to be writing, let the telephone go to voicemail, and stop flicking the television on to catch the Piers Morgan Tonight show on CNN or the latest jousting at the Leveson enquiry (which drone on interminably but are nonetheless fascinating). Time to read much more. Time to stop talking (and scribbling) about doing all of those things and get on and do them. Thanks, now where’s that e mail I must reply to?